Internally, the creation of the Abhdhamma Pitaka is unattributed to any author. Attribution for the creation of the Abhidhamma teaching was made in subsequent commentary. The real question is whether the teaching of Abhidhamma and Visuddhi Magga contain the Buddha's teaching. This is no difference to Sutta. Even Sutta does not have 100% representation of what Buddha taught. I think those monks who discourage their student to study Abhidhamma and Visuddhi Magga are irresponsible. Do you mean that 99% of what is said in these sources was literally said by the Buddha, and that the elders compiled additional content from the Blessed One which had been omitted from the suttas, for whatever reason? What I am saying is what those documents contains are Buddha's teaching but may be compiled in a different way. Even the Suttas are not what literally said by the Buddha. Sutta are also a tabulation or a compilation. "There is the case where a monk develops mindfulness as a factor for awakening dependent on seclusion, dependent on dispassion, dependent on cessation, resulting in relinquishment". ---MN 118. Whereas in the Visuddhimagga it is expanded on in the nine insight knowledges following contemplation of impermanence and dissolution.---Vism XXI. Even this expansion is find in Sutta somewhere. 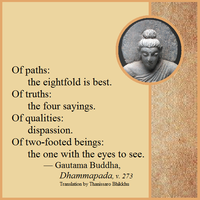 Nine insight knowledges is an example of a thing Buddha never taught. And many of such things are in there (Visuddhimagga, etc). This is called "Tharavada sloppiness"
Many Sri Lankan monks, scholars, and teachers are disavowing Abhidhamma and Visuddhimagga. The Venerable in the video, V.Vimalaramsi, is known for teaching "soft jhanas", which is different to how jhanas are presented in the Visuddhimagga. So, it seems only natural that he would speak against Visuddhimagga, since the underlying assumption seems to be that both cannot be right (which is also why those who prefer the more traditional approach would then speak against V.Vimalaramsi's interpretations). Having conversed with the Venerable online many years ago, I understand he did study the more traditional approaches in Mynamar, but he didn't find them to work for him for whatever reason, so he decided to develop his own approach to studying and mediation that he then later started to teach. Of course, the claim that his teaching agrees with what the Buddha taught while some other teachings do not (e.g. Visuddhimagga or Abhidhamma) is nothing new compared to pretty much any other modern teacher out there. As for whether Vsm and abhidhamma were taught by the Buddha or not - I was once given advice that the only way to really find out is to develop wisdom because "one who sees Dhamma sees the Buddha" (SN 22.87), and then you will know for yourself whether a particular text or teacher truly teaches in conformity with the Buddhadhamma, instead of relying on conjecture and spreading hearsay. Note to moderators: I am surprised to see this topic in the abhidhamma forum and have to admit it feels a bit like being back on e-sangha where you couldn't study what you were interested in without getting harassed by people telling you that you are basically an idiot because you have an interest in something that they think is not the legitimate teaching of the day. I thought the whole point of creating Dhamma Wheel 10 years ago was to have a place where Theravadins of all stripes would have a home that's free of harassment? That said, I'm sure people who prefer to frequent Modern Interpretations forum feel the same way when someone starts preaching from the traditional standpoint, but isn't that why there are moderators here and different subforums to organise the threads accordingly? Hence, Modern Interpretations sub forum for those that value modern interpretations, an abdhidhamma subforum for those that value abhidhamma, and so on.